With the season changing, dusk is arriving earlier each day. What once was a brightly lit afternoon walk has become a nighttime stroll. Of course, our dogs are creatures of habit, and when it comes time to walk, it’s not always easy to adjust. While the atmosphere is comfortable and even refreshing during the late evenings, there is the danger of reduced visibility. We don’t see well in the dark, but dogs usually turn to their nose to keep them on the right path. Since it’s the responsibility of a dog owner to guide their pet, we need to be able to see- and be seen. We have to take responsibility and prepare ourselves to safely walk during the night. Start at the beginning by organizing a clear and familiar route. Don’t go where you normally wouldn’t and stay where there’s plenty of lighting. Choose well-lit streets that are populated and secure. Avoid any areas that are dark and isolated. Parks tend to be attractive walk areas, but do not make a good night-time environment. It is possible to trip and fall when lighting is limited. Familiar neighborhoods are a much friendlier atmosphere for owner and dog alike. Busy streets can also prove to be dangerous. Avoid high traffic areas, especially highways. Additionally, choose areas where there are designated walkways and sidewalks. Never walk in the street. This is dangerous for you, your dog, and any traffic. Pay attention to the rules of the road as well. Remember that the left side of the road is designated for pedestrians while the right side is for bicycles. This is because you can see oncoming traffic, rather than them coming up behind and surprising both of you. This will help improve your line of sight and keep both of you safe during the nighttime adventures. Attire is one of the most important nighttime preparations. Be sure to brighten your attire. Wear white or lighter colors and avoid black, blue, or grey. Dress your dog to be flashy. Strobe collars and harnesses are becoming very popular, and allow both you and others to be easy to spot. Reflective tape around a normal harness would also work to improve visibility, especially in a high-traffic area. Visibility vests are also a safe investment. Just be sure they are made of a quality material that isn’t dangerous for your dog (they don’t try to wrestle it or chew on it). Just make sure that it doesn’t interfere in any of your dog’s natural practices (going potty). At night, it is good practice to carry a flashlight. Small LED flashlights are relatively inexpensive (two to five dollars at a thrift store) and are light enough to carry around. 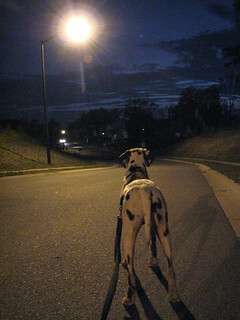 Everything you can do to improve your visibility is going to help a night-time walk. Just be sure that you stick to a safe route and know where you’re going. Keep your dog close and enjoy the cool atmosphere the fall weather brings.